More than 50 police workers, including officers, were fined for speeding in the Avon and Somerset force area last year while not on an emergency call. 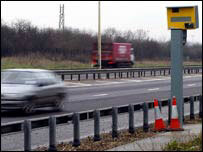 Figures obtained through the Freedom of Information Act show police vehicles triggered a speed camera 640 times. In almost nine cases out of 10, the penalty was cancelled, but staff were fined in the remaining cases. The charity Road Peace, which supports families of crash victims, condemned the figures as "horrifying". Spokeswoman Rita Taylor said: "These officers were fined - they were found to be breaking the law. "We feel the police are there to uphold the law, they must be shown they cannot break the law." In a statement, the force said some of the speed camera activations could have been caused by members of other constabularies passing through the area. But it said: "The high number of Notices of Intended Prosecution in Avon and Somerset Constabulary may relate to the fact we use strobe lights rather than revolving blue lights which are not always picked up by the safety cameras. "We would stress that we are an open and accountable force and will prosecute officers when they are unable to demonstrate their actions were for a lawful policing purpose. "If officers are prosecuted they can be put through a refresher course on the force's driver training programme." The statement added that the vast majority of police drivers were highly skilled and operated within the law. It said the figures must be put into context, as staff responded to nearly 50,000 call-outs last year. "The information being supplied to you refers to activations by police- registered vehicles, not necessarily to vehicles being driven by operationally-deployed police officers," the statement said.